Well here goes nothing. I guess it's time to unveil my kigurumi project. This is my first time making a kigurumi so please don't be too harsh with your criticism of what I do to make it but please point out any mistakes that I make along the way so I know what to improve on. So I'm going to be doing a kig of Dawn (Or Hikari if your from Japan) from Diamond and Pearl. So why did I chose Dawn? Well it's mostly because I instantly fell in love with her design when I first opened the manual of Pokemon Diamond and I found out she had gotten a winter redesign when Platinum came out so I could kig as her all year round. So as I was saying before that this is my first time making a kigurumi and it will actually be my first time seeing one up close. Now there is one rule that I set for myself, I am not allowed to go over $100 total (not going to include the cost of Dawn's outfit in there. Cheapest one I could find was $80.) I also set a personal deadline which is AnimeNYC (Nov 16). So wish me luck. In under 100$, this will be very hard. Especially when making first time, the material is almost that much. Hell, even the wigs will cost a big portion of that. I'd recommend saving up more so you can do it on a bigger budget. I'm actually going to be using mostly generic and off branded things for it to keep the cost low. I've already got a wig and corset for around $14 thanks to one of those pop up Halloween stores opening nearby, I just have to straighten and style it. As for the hadati I found a website that sells a zentai that claims to be for kigurumi at a low cost. I'm modifying a template that I found on thingverse for the mask. As I gain more experience I'll upgrade from there but I feel like it's a descent place to start. For hada, you probably should use cantillion. Cheapest hadas known to me at least. And all the other things sound nice, but I think you'll hit limits really quickly. Good Luck! It's always good to have big goals! Dream big or go home! Keep us in the loop, it would be fascinating to see how it goes! Yeah I agree, you're missing a zero in your price goal. Could you send me a link to their site? I can't seem to find it. Anyway I may be able to do this on a low budget. Here's my list of items with prices. Note: Not factoring in materials that anyone should have like ink and paper for a regular printer. Post was edited 1 time, last by “Buff55” ( Sep 29th 2018, 3:16pm ). 9 bucks for your "wig" is going to be a problem: You generally need 2-3 wigs to cover a kigu mask. And I wouldn't even trust one wig at that price point. I'd ballpark around $25-$50 here. Another thing easy to leave out here? Hairstyling supplies. Those alone could run over your $100 budget quite quickly. Another thing to factor in is the fact your first mask probably isn't going to shine (or even turn out in one piece). You might need to take 2 or 3 tries before you get something that you're comfortable wearing. While you can certainly get away with simply sanding and painting the 3D printed mask (as I did for the one in my PFP), the results from that are generally somewhat crude in terms of surface quality. 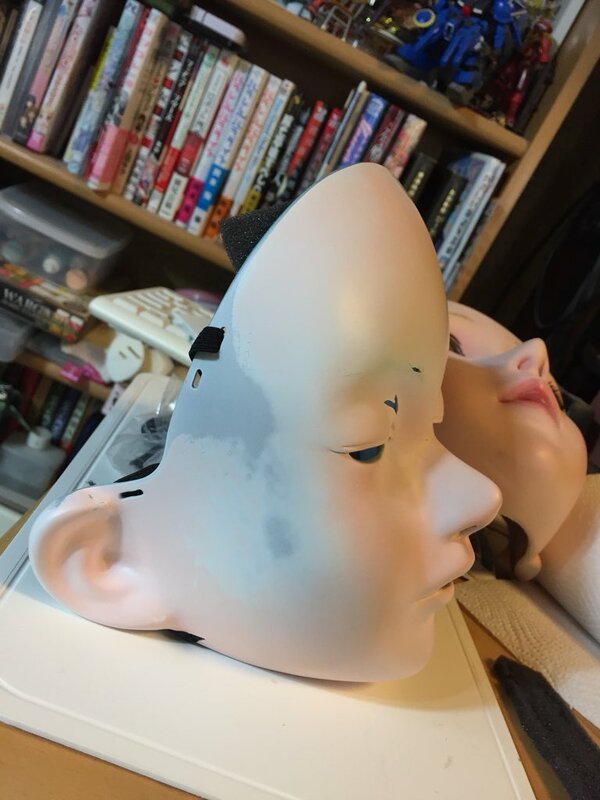 Most makers will either use a filler material on the print or, most commonly, use the print to make a negative mold to cast a more durable and heat-resistant resin mask with. You'll probably struggle getting something in one piece the first try, let alone something you'd be proud to wear in front of others - unless, of course, you have experience with things like prop-making. I won't get into cosplay outfits here since I have no experience, but you're probably going to want one, and a good one will make your wallet a lot lighter. I don't want to discourage you, however. I think my kig mask ran well under $100 in materials, although I had a couple things on-hand already. Just want to help point out possible hidden costs that are often glossed over. I don't exactly trust the wig ether but it's the only one that I could find that was the right color. I have bought wigs from that shop in the past and they're fairly good quality. Nowhere near pro quality mind you but good enough to get a decent amount of mileage. One that I bought from them lasted for around 4 years before it had to be replaced. Anyway the $9 was a typo. I meant to say $19 but my 1 key is busted and it doesn't work half the time. I wish you the best of luck my friend! Cheapest method of producing a mask I’m aware of is $300 (can’t say who). I think that with the single wig works fine as long as you make the mask a half-type, they are worn with the help of an adjustable strap and can be worn with any regular wig if you attach them with velcro. Above example is a Nukopan Di of that kind, it also saves material costs. Downside is that you can't do extreme hairstyles with half-type masks but that isn't needed with your choosen character anyways. Post was edited 1 time, last by “ichigomomomya” ( Sep 30th 2018, 3:24pm ). @ichigomomomya That may work better than what I originally had planed. I won't have to worry about not having any ventilation because of the hat covering the holes in the scalp ether. I'm still finding and gathering materials for my project. Not to mention that my job is currently slowing my progress significantly. Once I finish it I may try that 24 hr challenge that I've heard about. I say your budged is way hopeful. Reminds me people from home-building programs. Also as former replys in this topic mentions, it could be a good thing to expect first try to waste you moneys and effort. DIYing is learning by doing experience. I am aware that I may be cutting corners a little but it's the best that I can do with my limited budget. Post was edited 1 time, last by “Buff55” ( Oct 10th 2018, 8:11pm ). Sorry but I may have to stop the project for now. Things in my life offline are preventing me from continuing. It will be done by towercon 2019 though. Good news. The issues have been resolved and I can resume work on my kig. The bad news... Hard drive failure has cleared all my progress on the mask but I do have a picture about where I'm putting the slits for vision. It was a bit of a challenge due to the fact that the pokemon art style doesn't leave any good places for a wide range of vision but I think I have it so I can see a little to my left and a little to my right in edition to straight forward. I've marked the spots in pink. Great to hear you can resume on your project. I took liberties to scale your design at 8 1/4" in width. I'm concerned with the port layout being too far outside of the useable viewing area. The small rectangle is set at 2 1/4 inches in width. The larger boundary of the larger rectangle is right at the outside of usable viewing. As you can see with the current eye layout, you are way way outside of a useable viewing location. This is a common issue I've seen happen. While attempting to create a model or screen accurate design the usability of the mask itself becomes unusable. Sometimes form has to follow function and not the other way around. Not knowing the scale of your design I'm only making assumptions. The scaling on the pic I used was a little off. My mask's face won't be as wide as the pic makes it seem since it's going to have a closer sizing to my own head. Reducing the shell width to 7 inches let you just squeak by. Wall thickness of the shell will have an impact on the interior dimensions.